Music fans rejoice! Did you know that there are vinyl records in the Eco Relics architectural salvage warehouse? Even if you don’t have a record player (for shame! ), there are plenty of things you can do with our records. If it is unlikely that your old Johnny Mathis platter will ever spin again, consider repurposing it. A little heat will soften up the vinyl for easy shaping, forming, or cutting. Try an oven. microwave, heat gun, or even a blow dryer. Scissors or a utility knife will make short work of hot vinyl. Reheat as needed. Don’t forget gloves to keep those fingers of yours nice and pretty. Vinyl records can be made into bowls, magazine racks, purses, and more. Check out the vinyl tabletop made by an Eco Relics craftsman. Local street artists have also made use of vinyl to beautify our city. 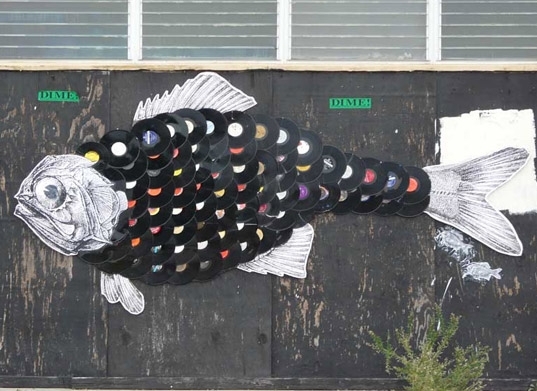 A Jacksonville-based artist repurposed these vinyl records into the scales of a fish. Coasters, chandeliers, wall art, lamps, picture frames…the list goes on. Look at that old stack of records as modular building units that will add retro style to any craft project, and suddenly another “Sing Along with Mitch” does not sound like such a bad idea.